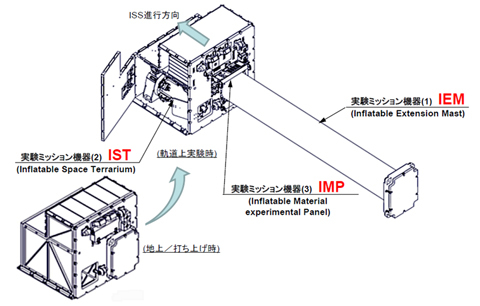 At 9:10 p.m. on August 24, 2012, the shape-memory polymers in the exposed environment were extended successfully, as one of the series of the Space Inflatable Membranes Pioneering Long-term Experiments (SIMPLE*), which had been installed on the Multi-mission Consolidated Equipment (MCE). This is the world's first achievement. Shape-memory polymers are the shape-memory and functional materials that use glass-transition phenomenon of high-polymer materials that deform to their original shape induced by glass-transition temperature. SIMPLE adopts a composite material strengthened with carbon fiber fabric, exposed two kinds of surfaces to space environment; 1. covered with a thermal control film that reflects sunlight; and 2. without the thermal control film. 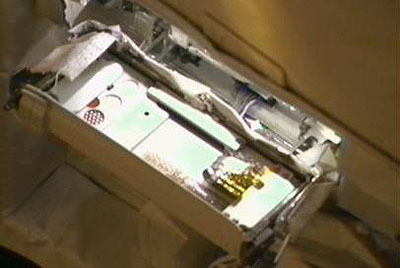 Both recovered to their original shapes (extended), 1. was heated with Joule heat while 2. was heated with only sunlight. The retests are scheduled a half year later, and the long-term (a maximum of two years) observation is also planned. 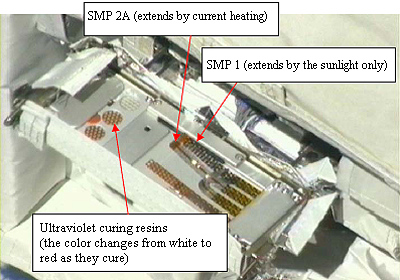 Application of the shape-memory polymer and ultraviolet curing resins of this experiment to a large construction on orbit or on the moon in the future is much expected.